Why would I need Period Delay treatment? There can occasionally be times when it can feel as if it would be entirely inconvenient to have your period. There are a range of circumstances to which this could apply. It could be that you are about to go on a major holiday or physically strenuous expedition, or because you have another special occasion – for example your wedding day and honeymoon - that you would like to be at liberty to fully enjoy. In these circumstances it is possible for our Online Pharmacy to supply a course of Norethisterone 5mg tablets, which can postpone your period for up to 17 days. We understand that having a period at an important or special time can be hugely frustrating. 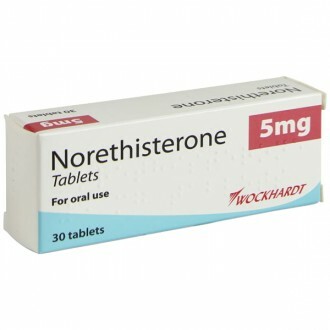 We are able to prescribe Norethisterone 5mg tablets, a progesterone hormone. Norethisterone can only be provided to delay your period for a maximum of 17 days. What does Period Delay treatment do? What Period Delay Treatment Is Available? Norethisterone is available as a safe, clinically-proven and convenient treatment that is taken three times daily to delay periods for up to 17 days. It gives you the control to have your period at a convenient time in your menstrual cycle. It is also available as the Pfizer branded treatment, Utovlan 5mg tablets. One pack of norethisterone 5mg tablets (30 tablets) can delay your period for up to 7 days, whilst 2 packs (60 tablets) can be used to delay your period for up to 17 days. During a woman’s cycle, the levels of oestrogen and progesterone vary, with progesterone levels dropping triggering menstruation. As a synthetic progesterone, norethisterone helps to keep your progesterone levels artificially high during your cycle preventing menstrual bleeding. It is very important to know that norethisterone is not used as a method of contraception and will not prevent pregnancy. Do not take norethisterone if you are already taking the contraceptive pill (see below for more details) and it should not be taken by pregnant or breastfeeding women. When taken according to the directions, norethisterone will typically delay your period. After you stop taking it, you will have your period within a couple of days. A few women may experience light bleeding or spotting whilst taking norethisterone, but the vast majority will experience none whatsoever. Does period delay treatment have any side effects? It is rare for women to experience side effects from norethisterone at this strength, but you may experience nausea, breast tenderness, fatigue or headache. In very exceptional circumstances, it can impact upon chronic diseases or interact with certain medicines. However, our Online Pharmacy service can give you more information as required, in addition to the manufacturer’s information leaflet. An alternative way of delaying your period and you are on the Combined contraceptive pill already is to run two strips back to back without taking your 7 day break. Alternatively you can see your GP and discuss your options, such as the hormonal implant or Mini pill. Norethisterone is a tablet that a woman can use to delay her period. These tablets contain synthetic progestogen, a female hormone involved in menstruation. Usually, it is a drop in progestogen levels which initiates a woman’s period. Norethisterone prevents the womb lining from being shed at its normal point in the cycle, causing the period to be delayed. Norethisterone is also prescribed to treat other menstrual problems including heavy periods and severe pain. Consult with your GP if you think you might need Norethisterone for these purposes. How often should I take Norethisterone? 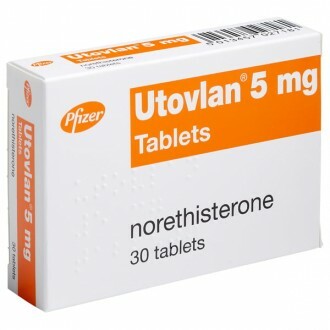 You should take Norethisterone three times each day – one 5mg tablet in the morning, at midday, and at night. Norethisterone will be most effective if taken at a similar time each day. These tablets are available in packs of 30, 60 or 90. These correspond to a period delay of 10, 20 and 30 days, respectively. Fixed dose combined contraceptive pills combine the same combination of oestrogen and progestogen for the duration of the cycle. These require you to have a pill-free week for a withdrawal bleed. You can delay your period by skipping this withdrawal week and immediately starting your next pack. Every Day contraceptive pills contain seven hormone-free pills, which you take instead of having a pill-free week. Delaying your period requires that you take hormones each day. So, with the ED pill, you will need to skip taking these ‘dummy’ pills and immediately start your next pack. Bi-phasic contraceptive pills vary their combination of oestrogen and progestogen, depending on the day of your cycle. To delay your period, you must skip your pill-free week and continue to take the type of pills just before the pill-free week, which is higher in progestogen. This will involve skipping the first section of the pack. The mini pill contains progestogen only. The mini pill contains only 0.35 mg of progestogen. Delaying your period requires three 5mg doses of Norethisterone each day. So, to delay your period, you will need to take Norethisterone on top of your regular contraceptive routine. When might I want to delay my period? This is entirely a matter of preference – many women take Norethisterone to avoid menstruating while on holiday or at a significant event. There are also some medical reasons why doctors may recommend Norethisterone. It can help women who suffer from heavy or painful periods, endometriosis, and severe premenstrual symptoms. Women at an advanced stage of breast cancer may also be prescribed Norethisterone. What are some side effects of Period Delay medication? If you have been using Norethisterone for a long time, you may notice breakthrough bleeding. Consult your GP immediately if you notice anything unusual whilst on Norethisterone, as there may be some more severe side effects in rare cases. Will Norethisterone prevent me from getting pregnant? Norethisterone on its own does not prevent pregnancy. So, you should use normal contraceptive methods while delaying your period. If you are delaying your period by modifying your contraceptive pill routine, or by combining Norethisterone with the mini pill, you will be protected from pregnancy so long as you use the contraception correctly. What is the longest I can delay my period for? To avoid more serious potential side effects, you should take Norethisterone for no more than two weeks if possible. If on the contraceptive pill, you should delay your period only until your next pill-free week unless your GP has advised otherwise. Is it dangerous to delay my period? It is usually not dangerous at all to use Norethisterone or the contraceptive pill to delay your period for a short amount of time. There is a low incidence of side effects, even for the mild complications like nausea and headaches. For how long will Norethisterone delay my period? Once you stop taking Norethisterone, your period will likely resume three or four days later. If you are delaying your period with the pill, your withdrawal bleed will occur as normal on the next pill-free week of your cycle. Will my period be heavier after being delayed? Norethisterone works by preventing the womb lining from being shed. So, it is possible that your period will be somewhat heavier than normal once it resumes. If you have only delayed your period for a short period of time, this should not be too noticeable. This is why you should not delay your period more than once during one menstrual cycle. How often can I delay my period? It is important that you allow your body to have normal cycles so that your hormones go back to their natural cycles. Ideally, you should go several months before delaying your period again. Before you begin delaying your period, you should go over your current medications with your GP. This is because Norethisterone may cause complications when combined with certain other medications.